Earn $2.06 in Rewards credit (206 points) What's This? Eliminate compromise in your race tire. The Grand Prix 4000 S II is even grippier, more durable, and faster than its predecessor. That's because Continental is able to improve their exclusive Black Chili compound just a little bit every year, thanks to their continued dedication to research and development. What is Black Chili? It's a unique rubber formula with an ultra-dense construction and high silica content, allowing it to deliver outstanding grip and blazing fast speeds. This cutting-edge formula is also optimized for reliability and longevity, making it a great choice when both performance and durability are top priorities. 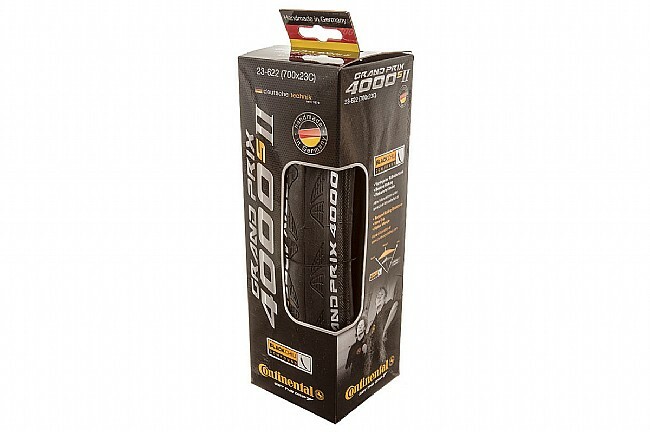 The GP 4000 S II also features Conti's patented Vectran puncture protection breaker. 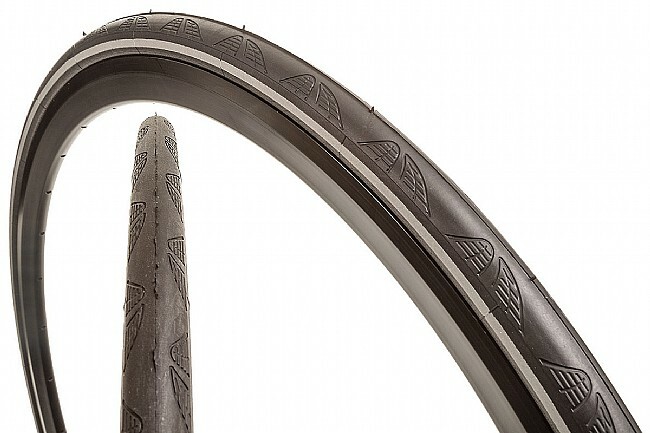 Vectran was originally developed by NASA in the construction of space shuttles and suits, and Continental has brought its otherworldly lightweight protection to bike tires, making these lightweight tires impressively flat-resistant. All in all, the GP 4000 S II is Continental's most advanced racing clincher yet, with a truly unique blend of speed, durability, and, now, aesthetics. 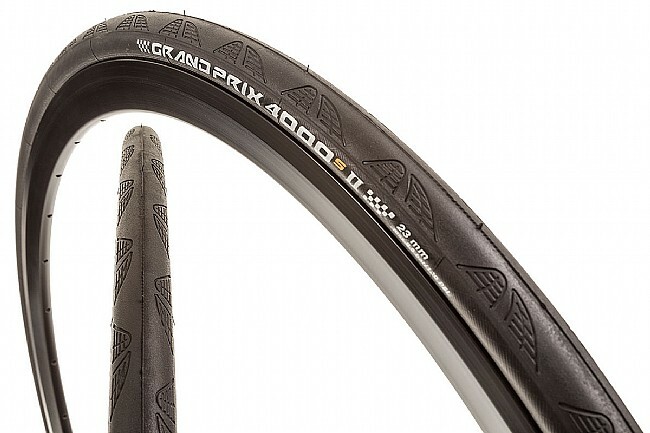 Thanks to the high-tech materials and years of testing and development, the GP 4000 S II delivers low rolling resistance and superb handling with exceptional puncture protection and higher mileage performance than a typical race tire. A friend recommended these tires to me and I've loved them. They have tiny marks in them for you to be aware of how much wear they've gone through and know when to replace. Didn't get the reflective kind but I think I will when shopping for new tires. Also rode in rain and they performed GREAT. Have ridden on this tire for 18 months in 28 width. Have always ridden 23 to 25 but after doing some more research decided to try the 28's. As with many things in life it's hard to admit that everything you thought you knew was right is proven wrong when you finally give in and try. These tires are not slower, they might be a little heavier but not enough to make a difference for most riders. Their toughness is amazing. I finally decided after a summer of riding to buy another set in preparation for spring. The current set has multiple slices that would have flattened other tires. Grand Prix 4000 s LL. This a great tire. Rolls very well. Good training tire or racing tire. Very fast. Well, out comes the GP 5000 for 2019, but I still look to the 400 for proven performance. You can't beat this tire reliability, grip, strength,....it has it all. I'll tell you how it lasts when I reach the 10,000 mile mark! This is my go-to tire. It's a fast tire and they feel stable when I'm screaming down a descent. I've tried other tires that are more puncture resistance but I find that the Conti 4000S tires are faster. I ride in the SF Bay Area where the roads (and bike lanes) are in terrible condition with a lot of debris. I've had a run of bad luck lately with this tire though. In the past 2 months, I experienced 12 flats, mostly from broken glass and one flat from a goathead. Our rough roads have eaten every tire I have tried (Michelin, Panaracer, including previous Continentals and a list of others). These were on sale and decided to give them a try, they are holding up better than expected with the use of kevlar liners and puncture resistant tubes-I spend time riding not repairing. I have been very impressed with the road feel of these tires and after a long ride I usually have slight cuts in the outer tire casing and so far no cuts. I have been riding for about 4 years and these are the best tires I have used. You can't go wrong with these tires. They're my favorite for both racing and training. Good quality and a nice ride. Have been riding for years. The only road tire I use! Been using these tires for years. Fast, supple and better then most regarding flats. That reflective stripe is very sharp especially with aero wheels. This tire doesn't disappoint. It offers a perfect balance of durability but is still light enough for quick training. It could even be a solid tire for race days. I used to ride exclusively on another brand of tire. A riding buddy said I should consider Continentals. The pair I ordered from Western are my reserve tires. The first set I bought ARE STILL GOING STRONG....5000kilometers ( about 3000 miles) ....NO FLATS !!! My go to tire for ten years! Just received my new Trek Madone bicycle. After a flat on second ride, ordered 4000s and replaced factory tires. Continental 4000 S2s are lighter, smoother and better looking. The reflective strip is very sharp! The only tires I will use on my bike. Gets an occasional puncture but prevents a lot more. Switching from a completely smooth road tire to a grippier one was the best switch. Massively versatile for a road tire. Love this tire for all my uses from commuting to race day. These tires have never let me down! And Western Bikeworks always has the best pricing and the best customer service in the industry! Perfect tire for year round use. Handles the wet roads found here for most of the year, and then really shines during the couple of months of dry. Range of widths provide an option for all. Does run a little wider than posted dimensions. Wow. Get'em while they're hot. I had previously ridden on Vittoria Open Corsa clinchers. These ride as fast as the Vit's but not as supple. The Vit's are good for a 1500 miles max. and seem to cut very easily.The speed advantage the Conti's provide more than makes up for the less supple ride quality and so far I've experienced no punctures. When on sale I usually buy a pair.